925 information packed pages, hundreds of gorgeous photographs, and approximately 30 pounds of heavy lifting await the reader who dares dive into Wine by Andre Domine. This wine book is a treasure trove of useful information for novices and experts alike. And its text book like structure of chapters on general information, vinification, and wine producing regions ensure its ease of use. The detailed appendices offer practical information (glossary, vintage charts) as well as handy search criteria. This wine book goes far beyond others in discussing the climate, soil type, and specifics of the region in addition to the general grape types and wine making methods. Any reader wishing to know more about a particular region should start with this book for its breadth, depth, and informative nature. The book is heavily Euro-Centric with old Europe encompassing over 500 pages alone. Though the author does also delve into some less covered regions such as Turkey and Japan. 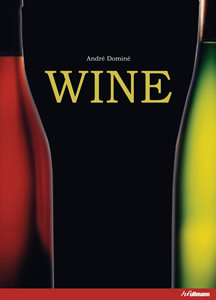 A great addition to any oenophile’s library or the novice wanting to learn more about the world of wine; Andre Domine’s Wine is a tome that shouldn’t be missed.